Clay Tile Roofing Toronto (GTA) - Pro Roofing - Pro Roofing Inc.
Clay roof tiles provide a wealth of colour choices and textures which look good on the day that they are laid but also improve their looks as they weather to produce a warmth and depth of character. This is apparent from the large stock of historic buildings with original clay roof tiles that exist today, still performing their function with an elegant appearance. 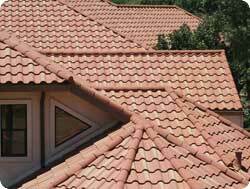 The benefits of clay tiles which produce this longevity are due to the nature of fired clay. Clay roofing tiles do not fade over time as the colour is an integral part of the tile and is not ‘bleached’ by the sun or is not leached away by the rain. The life span of clay tile roofing is influenced by the type of clay, the way it is manufactured, the dampness of the atmosphere, the position of the building and the pitch of the roof. All these factors will influence the speed of the weathering process. But, the colour of genuine clay roof tiles is permanent and they are highly regarded for this attribute. One of the advantages of clay tiles that has kept them a staple for centuries is the ability of clay to insulate, keeping inside temperatures warm in winter and cool in summer. Combined with a natural ability to reflect, instead of absorb, heat from the sun, clay tile roof can reduce the energy required to maintain comfortable temperatures in your home. Other characteristics of roof clay are fire and chemical resistance, also clay roofing tiles do not harbour organic growth to the degree with which it attaches itself to other types of roofing materials. The cost effectiveness of clay roofing makes it ideal for both new build and refurbishment projects, and with the ability to age clay roofing tiles artificially you can ensure the roof blends in with the local architectural heritage.